Why we should listen to Kate. A few months ago I started following the blog of an inspirational lady. Kate Swaffer is, amongst many other things, an "advocate and activist for aged and dementia care". She also happens to be living with the disease. As the parent of a child with a disability I have often gone to great lengths to make sure that professionals understand that I am the expert on my son; I advocate for him and know him better than they ever will. So it isn't rocket science to understand that this is no different from anyone else with a disability; they or their advocates know them best. If you search in googleimages.com for an image to match the term ‘Day Care’ you mostly only find images for children day care services and centres, as per this image I have added today! I wrote the following for a friend and colleague, to read out at a conference who is attending soon with an audience of life style and activity co-ordinators. “Let me begin with the word ‘day’ used in ‘day’ respite. Many people with dementia, who are over the age of about 5 or 6, feel the use of the word ‘day’ program, ‘day’ respite, or ‘day’ activity centre, is little different to the use of the term ‘day’ care that we took our pre school children to. It is, in itself, infantilising us before we even get there, and many with dementia would simply refuse to go to any respite program with the use of the word ‘day’ in it. Let me finish with a few words about what happens in these well meaning ‘day programs, and how offensive some of the things that happen there,that I and many others with dementia find them to be. Using ‘gold stars’ for winning some make believe event, or plastic ‘gold medals’ for the best piece of ‘art work’. Often, people with dementia are almost forced into these programs, to give their care partners a much needed break, but, the activities need to be age appropriate, and truly engaging and individually meaningful. By that, I mean meaningful to us, and with some inherent value to our lives and existence, not easy for you or of interest to the lifestyle coordinator. Activities need to also have some inherent value in them, value to our lives, things that make us want to get out of bed, not just fill in the time and the boredom of being there. Real activities, like going out into our community and being supported to volunteer or joining a sporting club, a gardening club, or even a social group outside of the place of respite. Activities like singing, music and dancing, but only if we like those activities. Some of us might prefer to be in a book club. This is also, after all, part of being I our community, and part of our community being dementia friendly. Working myself in residential care I can only hope that not all Day Care centres are as Kate fears, I do know though that many residential homes are. If you work in this field or spend time with someone who has dementia please think and think again when you plan activities. Read and re-read Kate's advice, she knows, she's living it. Dementia - is there a place for children's toys? Is it appropriate to give an adult, living with dementia, a child's toy to play with? I first came across the concept of 'stage not age appropriate' from Teepa Snow, an American Dementia Care expert who has a refreshing approach to working and living with people who have dementia. There are also a heap of videos you can find on Youtube where she talks about her approach. The stages of dementia are loosly definable but are different in everyone and can involve all parts of the body and personallity. I really believe that pitching daily activity at the individual's own personal level, what they can do, what they are finding pleasurable is the route to the most fun and fullfilling experiences. Think about what stage that person is at, and try not to worry so much about their age. Let's take jigsaw puzzles as an example. An individual with dementia may have once loved to do jigsaws; 1000 piece, back to front and upside down jigsaws. As their concentration skills, patience, memory and maybe even fine motor skills diminish these complex and demanding jigsaws may become unachieveable. So do you therefore take 'jigsaws' off the to-do list? Instead why not try easier puzzles. There are jigsaws available specifically designed for people with dementia, like this one (they will even personalise a jigsaw with your own photo!). I have used these particular jigsaws at work and the advantage of them is that the jigsaw is inset within a border of the photo so that you have clues for where to start straight away making it easier and less intimidating. So far I don't think this is too controversial. Buying products aimed at the 'dementia market' makes them acceptable to most people. If this size of jigsaw becomes too hard you can move on again. 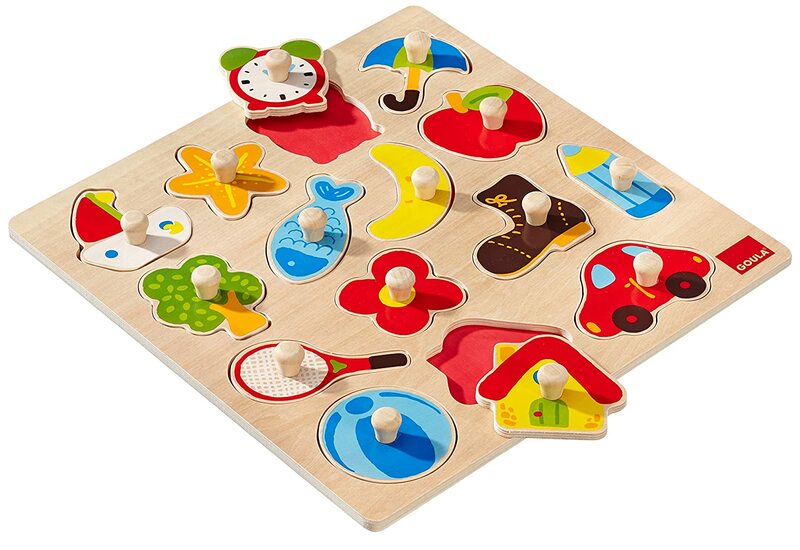 I have successfully used toddlers peg puzzles, like the one you see below with great results. I would usually begin by asking the person if they like the puzzle, the colours etc. Invariably I would get a reply about how they used to give the children one like it, or something similar. I might ask if they'd like to have a go, or "I wonder if we could do it?" This is usally enough to get us going. Sometimes you do get a negative reaction. One gentleman said rather gruffly "that's a children's toy". His tone of voice left me in no doubt that he didn't approve. Don't forget though .... it doesn't mean never. You can always try again another day. If you are asking why I think this might be a sensitive subject then you are already with me on the stage / age appropriate debate. Many people however do find the idea of giving their Grandpa or wife a children's toy. It is insulting, inappropriate. Have you got anything to lose by giving it a go? If it feels uncomfortable try it when you are on your own together, guage their reaction. Try different things. I am a forty-something mother of two. of people living with dementia. have something useful to share.